I hear you on the picky eater! My husband can eat spaghetti day in and day out...don't know how he is not sick of them yet. I’ve never made chicken chili, but this sounds real tasty. And I do love the fact that it's made in the slow cooker! Now this is just so beautiful! Looks extremely tasty..will try it! What a beautiful dish sure to please anyone! I can only imagine how wonderful this makes your house smell. Looks fantastic! What a fantastic and beautiful recipe for those busy on-the-go days and easy enough that even my teenager could through it in the slow cooker. Definitely a winner! I am always looking for new things for my slow cooker. Thanks for sharing! This looks delicious! 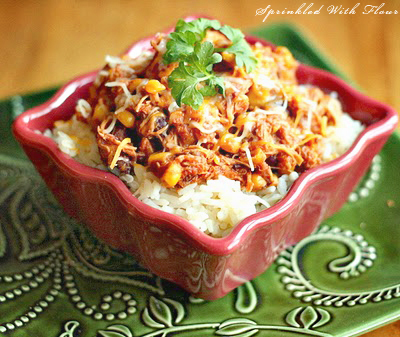 I love slow cooker meals, especially when I'm busy at work and need a quick, easy meal when I come home. Amber, that looks fantastic! I don't use my crock-pot enough, but am always looking for a reason to pull it out! Like you I tend to feature a lot of baking on my blog. Thanks for giving me the inspiration to break out into other things. This looks so good and I'll be trying it soon. Sounds interesting, may have to give this a try, thanks. Oh my! This sounds (and looks!) divine!!! Adam's not so much picky as demanding. He'll eat most anything but it has to be good! I'm very sure this will more than satisfy him. Thanks for posting! I'm thinking my picky husband would like this one as well... and it might even pass the picky 14 year old boy who would like to live on burritos test! We're going to try it! But I know there is no way I can get a photo as nice as yours... really nicely done! Hi Amber! I'm a huge fan of baking (as you know :-) But I'm not big into cooking (partially because I'm the picky one!) But this, my dear, looks delicious. Thank you for sharing your words and this recipe. And thank you for your kind thoughts on my own blog. I appreciate you! 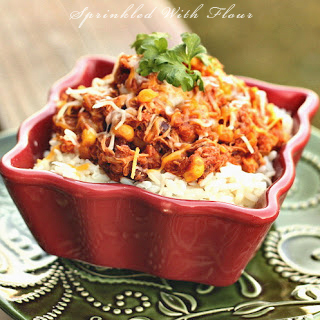 I am so making this chicken chili this week, sounds great and sure looks good on that bed of rice. Thanks so much. You have such a pretty site! 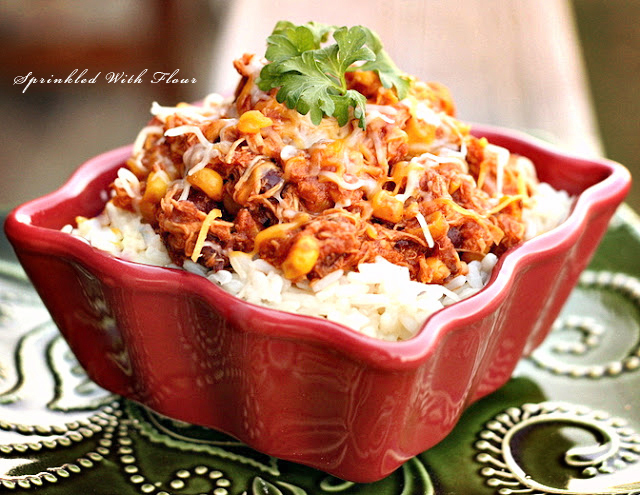 The taco chili looks amazing! Thank you for visiting mine. This looks totally delicious. I love stuff like this. And it's so easy to make! That chicken taco chili looks so tasty! This is also great with hamburger and cooked on the stove! I tried it and LOVED it. My friend made this last night and it was so tasty! Instead of using a slow cooker she just cooked it slowly in a pot on the stove. Yum! Amy, I'm so glad you enjoyed it! Great blog - I love the name and the pictures are gorgeous. I have this in the crock pot right now for New Year's guests tomorrow. Smells heavenly. It's in the slow cooker right now, and I just had to have a taste - wow!! Yum! I added cilantro & lime juice, and I'll make it with rice and put sour cream on top. I realized I was running out of time for the slow cooker so I browned the chicken on the stove a bit first. Just to make sure we aren't eating at 10 pm lol :) Thx for sharing! So gorgeous! I have been using my slow cooker quite a bit lately. I can't wait to give this a try. Thank you for sharing! PS: Love your dish! do you cook the chicken first and then place it in the crock pot? or place it on top of everything raw? I made this today and it was sooooooo good! I used hot rotel and added two diced jalapeños. My husband loved it too! I cooked this today and it was so goooood! I used hot rotel and added two diced jalapeños. My hubby really loved it too! I believe you used to have a white chicken chilli recipe on here and I cant find it anymore..did you take it down? This was REALLY good, can you please give me the nutrition info on it?